Telomere, Glycation and Mitochondrial Dysfunction - Dori Naerbo, Ph. D.
Inflammation is a natural body reaction in response to infection or tissue injury, which helps man to boost immune defenses and overcome stress. Acute inflammatory responses are often triggered by trauma or invasive microorganisms such as bacteria and viruses, but if well-controlled, these immune responses may help prevent further damage and assist in body repair processes. On the other hand, prolonged cellular stress caused by certain stimuli such as pollution, poor diet, lack of exercise and other lifestyle factors can cause chronic inflammation, which can lead to premature aging and chronic disease. Chronic cellular stress often leads to cell dysfunction and many mechanisms for how these processes occur have been proposed. One of these mechanisms is glycation, which can lead to dysfunction of the mitochondria, the specialized structures that are often called the “powerhouse” of the cell. These rod-shaped organelles convert oxygen and other nutrients into ATP (adenosine triphosphate), or chemical energy, which provides power to various metabolic processes in the cell. Mitochondrial dysfunction disrupts normal cellular activities and may to cell death, accelerate aging the aging process and development of chronic disease. Various normal metabolic activities in the cell produce byproducts that can accumulate and harm the body. For example, one of the byproducts of energy generation by the mitochondria is the formation of free radicals, which are molecules that can damage other cellular structures. These free radicals can initiate a cascade of signals that trigger inflammation and may result in cell death or uncontrolled growth of abnormal cells. In healthy cells, these byproducts are often eliminated or destroyed to maintain the well being of the organism. However with chronic exposure to environmental toxins, such as tobacco smoke and other natural stressors, cellular dysfunction arises and increases one’s risk for chronic inflammation and disease. Glycation is another mechanism that can result in mitochondrial dysfunction and chronic inflammation. It is a natural chemical reaction in which a simple sugar or carbohydrate molecule attaches to another bio molecule such as a protein, lipid, or nucleic acid without the help of enzymes. Unlike glycosylation, which is a similar metabolic process that is catalyzed by an enzyme, glycation usually disrupts normal cellular processes and are usually associated with oxidative damage. During glycation process, simple sugars like glucose and fructose act as reducing sugars, which become attached to proteins, nucleic acids or lipids, forming glycation adducts called Schiff base over a few hours. Healthy cells can eliminate these byproducts, but with chronic inflammation, these compounds can rearrange to become more stable compounds called Amadori products. Over months, accumulation of these compounds can lead to a series of chemical reactions that result in irreversible formation of highly stable substances called advanced glycation end products (AGEs). AGEs normally form at slow but constant rates in the cells and may accumulate with time. The accumulation of AGEs occurs when there is an increase in their production and/or a decrease in their elimination. With aging, low protein turnover, for example, results in the accumulation of extracellular AGEs on collagen, resulting in wrinkles. In diabetics, high plasma levels of glycosylated hemoglobin (HbA1c) increase as a result of high blood glucose levels. Studies show that abnormal biochemical processes resulting from chronic inflammation can also increase the formation of intracellular reactive dicarbonyl substances called methylglyoxal and glyoxal, which target mitochondrial proteins, as well as mitochondrial DNA and lipids for glycation. Laboratory experiments have shown that glycation of mitochondrial proteins, lipids and DNA could result in decreased oxygen consumption of the mitochondria, reduced ATP production and increased free radical formation. Researchers have therefore suggested that mitochondrial dysfunction may be induced by glycation and this may help explain how various conditions such as diabetes and aging occur. 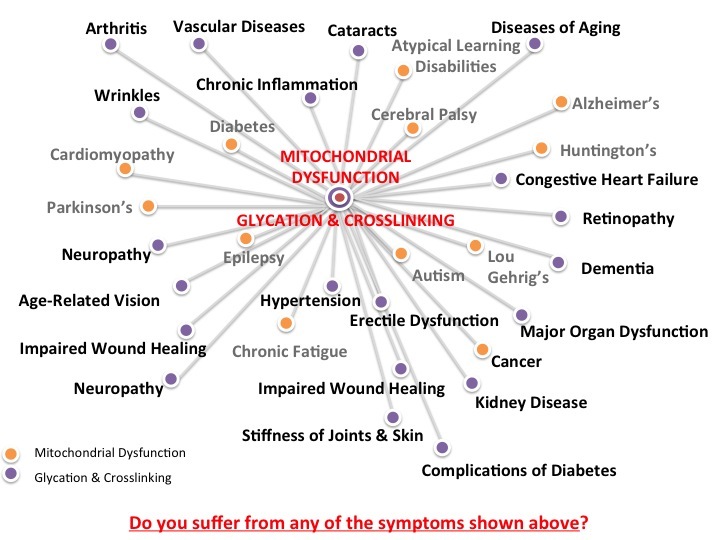 Aside from aging and diabetes, research suggests that increased glycation and mitochondrial dysfunction may also be involved in tumor growth or cancer, since a strong correlation has been found between increased mitochondrial DNA mutation and tumor progression. Furthermore, glycation-induced mitochondrial dysfunction has also been proposed as a mechanism for the development of neurological disorders such as Alzheimer’s disease. More studies have to be done to confirm these proposed molecular and cellular mechanisms that explain pathological processes involved in aging and disease. Some scientist also wonder whether it is aging and chronic disease which trigger mitochondrial dysfunction, because these conditions are often accompanied by accumulation of aberrant proteins and decreased ability to eliminate dysfunctional mitochondria. Experts recommend that eating a healthy, balanced diet can prevent excessive glycation and chronic inflammation. A diet that is low in calories, sugars and fat may reduce glycation and mitochondrial dysfunction, which helps prevent diabetes, heart disease, cancer, and other chronic diseases. Furthermore, a diet rich in vitamins, mineral and other antioxidants can help reduce free radicals that cause cell damage. Regular aerobic exercise, on the other hand, increases mitochondrial function and reduces the number of inactive, dysfunctional mitochondria. Studies show that certain dietary supplements such as benfotiamine, a synthetic derivative of thiamine of the B-vitamin family, and carnosine, a naturally occurring amino acid, can help reduce glycation. These substances may help block the formation of destructive AGEs and help prevent disease. Two nutrients have also been found to support mitochondrial function and protect against inflammation. Coenzyme Q10 (CoQ10) is a natural compound involved in ATP production in the mitochondria while pyrrloquinoline quinone (PQQ) is a coenzyme involved in cellular energy metabolism, development, and function. These substances protect mitochondria from oxidative stress and thus help prevent mitochondrial dysfunction. However, if telomere shortening is the primary cause of mitochondrial dysfunction, which sets into motion the death spiral, the superior supplement to take is telomerase enhancer such as TA-65. Hipkiss, A. Aging, Proteotoxicity, Mitochondria, Glycation, NAD+ and Carnosine: Possible Inter-Relationships and Resolution of the Oxygen Paradox.